13th February is the death anniversary of two great leaders of the Central Government and P and T employees. It was on this day in 2000 that Com.N.J.Iyer, the indomitable fighter for the cause of P and T and Central employees, left us forever. It was on this day again, in 2015 that Com. 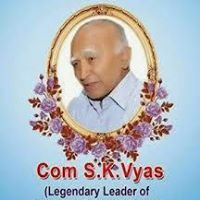 S.K.Vyas, the legendary leader of the Central government employees passed away. Both of them were unparalleled fighters who led several struggles of the CG employees and achieved many results. I had the fortune to be guided by them in my TU activities. I came in touch with both of them after the 1968 historical strike and especially during the inhuman victimisation of the workers who went on strike. Whenever I went to Delhi, I got one free meal from Com. Iyer and staying place by Com. S.K.Vyas at the Confederation Office premises. I avoided going to Dada Ghosh Bhawan, the CHQ of E.III since there was constant fight on the question of policies to be adopted and action organised with GS Com. 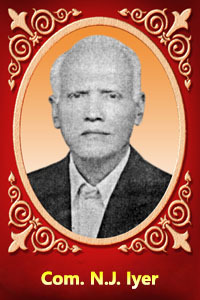 O.P.Gupta. After I shifted to Delhi in 1991 consequent to being elected as the President of E.3 Union (affiliated to NFPTE) there was constant touch and interaction with both of them, Com. Iyer as the GS of R.III Union and Com. Vyas as the SG Confederation. I still remember the confidence shown by Com. Iyer, by handing over the valuable original typed copy of the Article by Com.Dada Ghosh on ‘Origin of P&T Trade union movement’ which after getting typed a fresh copy, was returned to him. Both were leaders with great vision served the workers in very difficult situations. Their lifestyle was the simplest. Both prepared their own food and served others when there were visitors. Vyasji used to come to Delhi by Bus from Rajasthan and after getting down from the bus walked about one kilo meter to reach Confederation office opposite Sir Gangaram Hospital, till the last days. Iyer was not different. The image of Com. Iyer marching with a red cap in his head, ahead of thousands of P&T workers through the streets of Delhi after the P&T Convention in 1972, from West Patel Nagar to Boat Club near Central Secretariat for many kilometers, as the commander of an army still inspires me. It was also noteworthy that the Communications Minister Shri H.N.Bahuguna, came to the Raisina Junction and received the memorandum, instead of waiting in his office for the delegation to come. They were giants of the Trade Union movement who guided the workers at the most difficult times and showed the correct path to the future generations. Red Salute to Com. N.J.Iyer and Com.S.K.Vyas on their death anniversary!